Moving people and goods around is essential to our regional and national economic competitiveness. Everything is driven by our transportation and transit infrastructure, from how we get to work to how we get our groceries. The decisions and policies our elected officials pursue can drastically impact our everyday lives. How do we make sure that those decisions keep us moving forward? 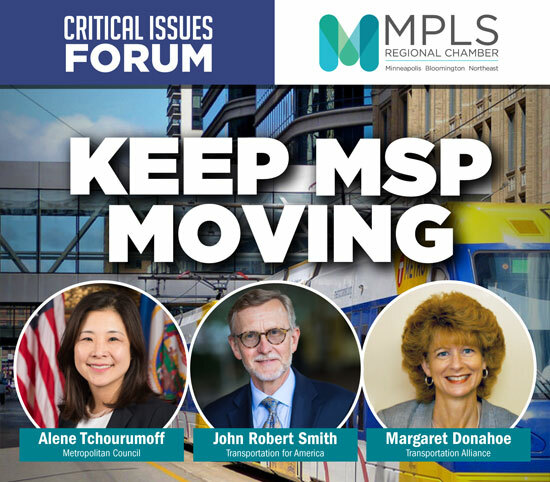 John Robert Smith, chair of Transportation for America, Charlie Zelle, Commissioner of Transportation, Alene Tchourumoff, chair of the Metropolitan Council, and Margaret Donahoe, the executive director of the Minnesota Transportation Alliance, will discuss current policies as well as the leadership we need to develop a successful transportation and transit system throughout Minnesota.